RADIO PRAGUE ON CROSSCURRENTS, 8/31 – Doggedly Yours… Howling, Humor, and History. RADIO PRAGUE ON CROSSCURRENTS, 8/31: From invasion to resistance and through oppression to revolution, Radio Prague which began international broadcasting on this date in 1936, has born witness to the history of the Czech people. 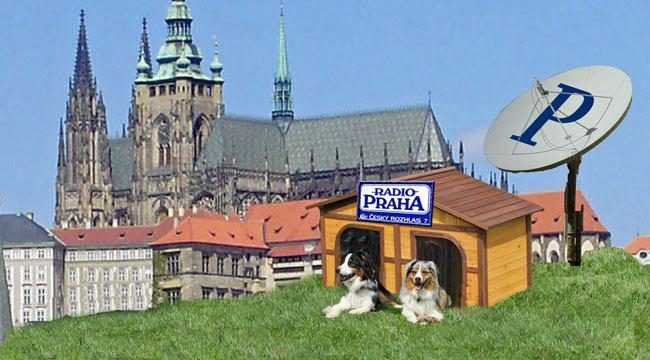 Gavin and Wyatt relax outside their dog-radio transmitter on the hillside overlooking the Prague Castle. You can listen to the best in country, folk, and rock music from the Czech Republic as John celebrates Radio Prague on Crosscurrents, 8/31 at 8 a.m.